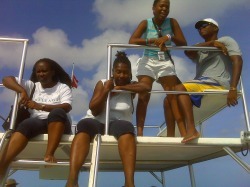 Our Fun Fishing Trips are for Local Barbadian Groups only. 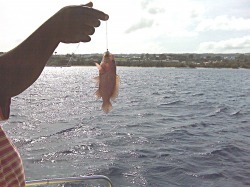 Catch a variety of very tasty reef fish in the cool early morning.Tour Package #1: Fish 'n Go. BD$55ea. Minimum tour group is 20 persons. 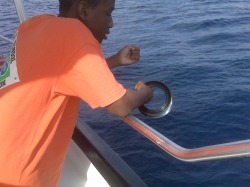 Guests must travel with an adequate supply of water, beverages, and snacks for a 2 hour tour at sea. 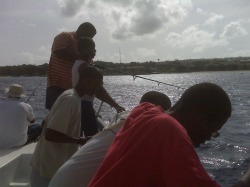 We supply the bait, and the fishing lines, the safe and insured boats with music. You just catch the fish. Tour Package #2:Fish 'n Drinks. BD$65ea. We supply drinks (fruit juices and water) and light snacks. We roast your catch, and add roasted breadfruit, or sweet potato, according to availability. Guests provide beverages and snacks for this tour. It's not all fishing, there's chilling too! Tour Package #4:Fish, Eat 'n Drink. BD$75ea. We roast your catch, and add roasted breadfruit, or sweet potato according to availability.